Alegre means “malipayon”. 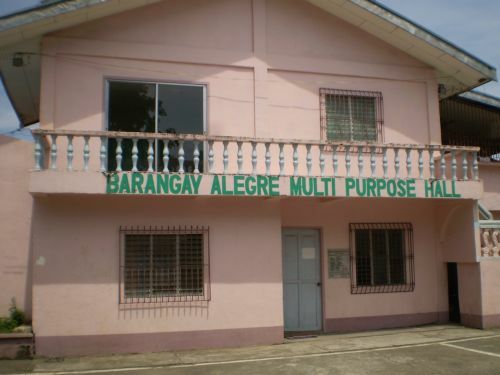 The barangay is approximately 2 kilometers from the town proper. The people of the Barangay celebrate the Annual Civic and Religious Fiesta every 13th day of the month of May, in honor of the patron saint, Nuestra Señora de Fatima. Long ago people of Alegre largely depend on “tuba” (alcoholic drink fermented from coconut sap) business as the main livelihood. Today, they are engaged in selling/manufacturing dried fish, fishing, cockfight breeding, bakery and “meke” production. The barangay has also improved and developed its beaches and resorts, which are often visited during weekends. KTV bars and other refreshments can also be found in the barangay.